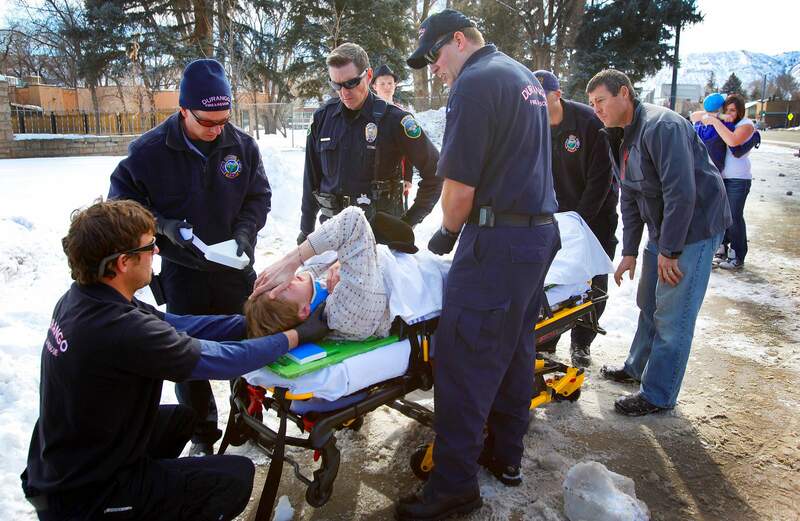 A Durango High School student speaks to Durango Police Officer Gregg Dodd as paramedics with Durango Fire & Rescue Authority prepare him for transport. The student was assaulted Thursday at the entrance to La Plata County Fairgrounds during the schools lunch break. He was taken to Mercy Regional Medical Center with nonlife-threatening injuries. An 18-year-old Durango man was arrested Thursday on suspicion of assaulting a 17-year-old Durango High School student near the entrance of the La Plata County Fairgrounds. David Renfrow, 18, was booked into the La Plata County jail with a $1,500 bail on suspicion of assault, a misdemeanor. He is suspected of attacking a 17-year-old boy who is the ex-boyfriend of the suspected mans current girlfriend, said Lt. Ray Shupe, with the Durango Police Department. The boy suffered minor injuries and was taken to Mercy Regional Medical Center for observation. According to witnesses, the 17-year-old boy was walking away and Renfrow jumped him from behind, Shupe said. The fight was over a girl, he said.